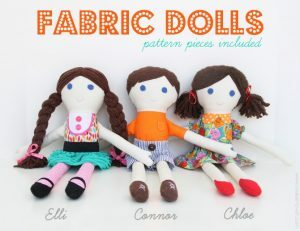 Fabric dollies are great gifts to make for kids. What could be more fun than personalizing a little friend made especially for your favorite tot? Fabric dolls can be a great scrap-busting projects too; all you need to dress up a dolly is to dig into your scrap bin for a few bits of pretty fabrics and trims! Here are a smattering of our WeAllSew team’s favorite free DIY dolly projects from around the web. 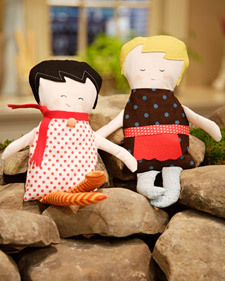 Ashley from Make It and Love It shows you how to make an adorable girl or boy doll with her Fabric Dolls pattern and tutorial. As Ashley says in her post, “There’s just something about a homemade fabric doll. It’s soft, it can be personalized, and it’s perfect for the little ones to drag around.” We totally agree, Ashley! 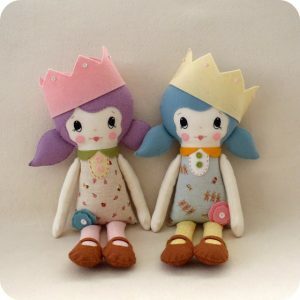 These cuties come from Shelly at Gingermelon; click to her blog to get the Free Doll Pattern download. I just love the little extra touches to these dollies – the crown, the little flower trim on the dress, and how cute are those little shoes! Emily Martin created these adorable Black Apple dolls for Martha Stewart, and you can download the instructions and pattern from MarthaStewart.com. Also find a link on the page to a video to see exactly how Emily makes the dolls. These sweet dollies are not only free, but the pattern was created especially with needy children in mind. As the creator of the free Dolly Donations doll, Sarah suggests: Why not make one for your own child, and stitch another one for a child in need at the same time? Find Sarah’s Dolly Donation doll pattern links here, and visit the Active Doll Drives page to find out where to send donated dollies. What little boy (or girl!) wouldn’t LOVE to have their own salty pirate to play with? 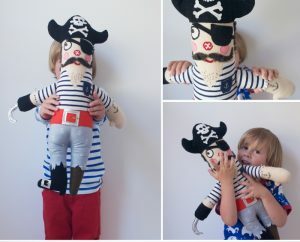 Merete from One More Mushroom shares the Pirate Doll how-to right here. 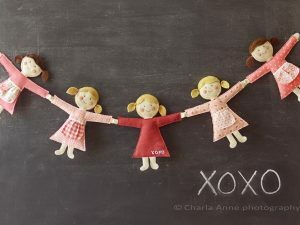 And what could be sweeter than these little dollies all holding hands to form a garland? Not much, in my opinion! 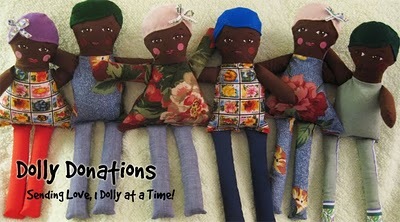 Get the DIY Doll Tutorial from Charla Anne, and make a whole string of different dollies! Next Next post: “Dress Up Your Duds” 4-H Competition: Shelby’s a Winner!